I read somewhere the other day that potato salad is making a comeback. Did it go somewhere and no one told me? It’s always at our house. 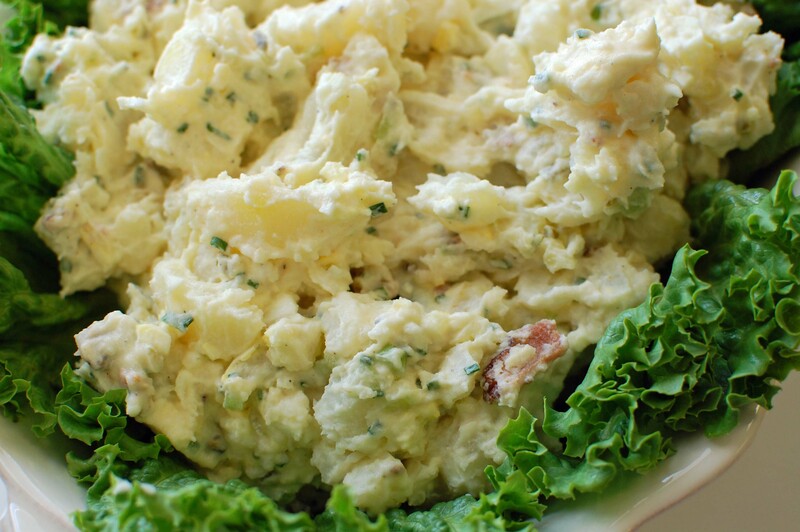 Potato salad is one of my all time favorites. One of the best that I have ever had is Julia Child’s American Potato Salad. Oh my goodness, it is so good! You cannot go wrong with this salad. When I bring this dish to a get together there is not a morsel left. It is that good. Julia Child has always been an inspiration to me. Just the fact that she went to culinary school so late in her life is astounding. I was mesmerized by her voice and cooking skills on her TV cooking show way back when. I spent many hours wishing that I might someday cook like Julia. I do cook in a setting much like Julia’s, but in no way with her same skills. Years back on a trip to Washington DC I was thrilled to learn that Julia’s kitchen had been place in the Smithsonian. I spent hours there just looking and reading. I wanted to take it all in – the kitchen that I watched Julia tell me how to roast the best chicken. I was in heaven! Julia’s American Potato Salad is exquisite !! It has so many layers of flavor. One trick that my mother taught me is to add vinegar or pickle juice while the potatoes are hot makes a huge difference in the flavor. I did find that one thing in the recipe did not work for me. Her recipe calls for 2 pounds of potatoes. On two occasions I tried the recipe with 2 pounds of new waxy potatoes and found the salad had too much dressing. What worked well for me was using 5 pounds of Idaho potatoes. You are going to love this salad and yes it has bacon in it. Julia was way before her time. Put the slices in a saucepan with water just to cover and 1 1/2 teaspoons of salt per quart of water. Heat to a simmer, and cook the potatoes for 5 to 6 minutes, or until just cooked through. It is essential that they be just cooked through. Bite into a slice or two to be very sure. Immediately remove from the heat and drain the potatoes into a colander, but save a cup of the cooking liquid for dressing the potatoes. Transfer the potatoes to a large bowl. Stir the cider vinegar with ⅓ cup of the potato water and drizzle this over the potato pieces, turning them gently to distribute it evenly. Let sit 10 minutes to absorb the liquid. Add the prepared onion, celery, bacon, pickle, hard-boiled eggs, and chives, and season carefully to taste. Top with ⅔ cup of mayonnaise (or a mix of mayonnaise and a bit of sour cream) and, with a large rubber spatula, gently fold everything together until well blended. Taste the salad and add more salt, pepper, or mayonnaise as needed. To serve, line a bowl or a platter with red-leaf lettuce or other greens, and mound the salad on top.